This blog had quite a few Wopex related blog posts over the years – and here’s the latest one: about the new generation of Wopex pencils. This is the third generation I know of, but there might have been more. I got the sheet from the 2010 blog post out and added the new 2017 grades. Just a quick reminder. Staedtler introduced the Wopex (pencil) in 2009 – it’s an extruded pencil and its body is made from a wood-plastic-composite (which consists of more wood than plastic). 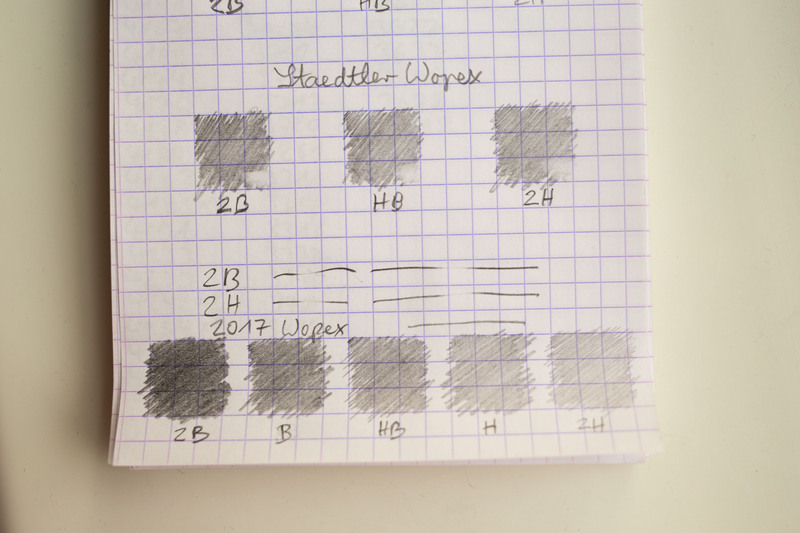 In 2010 Staedtler introduced the Wopex in 2B and 2H. I had a closer look at the 2B and 2H version in a 2010 blog post and couldn’t find much difference between the 2B, HB and 2H version. Fast forward to 2016. By now Staedtler is using the term Wopex only to describe the material used to make these pencils. Wopex is not used anymore as a name for the pencil itself – at least not by Staedtler. At the Insights X 2016, they had a few prototypes of the new ‘Wopex material’ Noris eco in 2H, H, HB, B and 2B. At the Insights X 2017, they showed the final product. 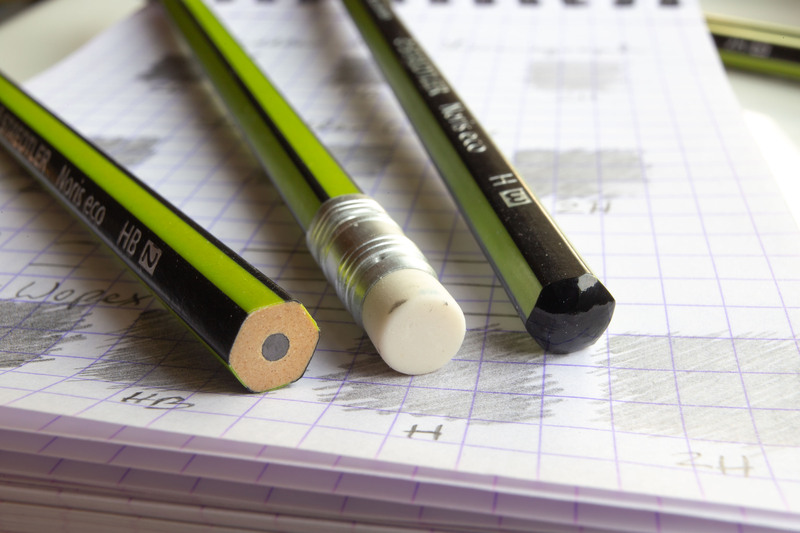 The design of the Noris eco is clearly inspired by Staedtler’s European staple pencil, the Noris, but like other Wopex material pencils, the surface of the extruded Noris eco feels rubberised. It is also eco-green, but has the same black stripe pattern as the yellow Noris or the red Tradition: The two opposing, labelled sides (let’s call them top and bottom) of this hexagonal pencil are black. The four sides (let’s call them the two right and the two left sides) are green with a think black stripe in between. I am mentioning this because some of the prototypes had a different pattern. Unlike previous Wopex material pencils, the new Noris eco has a cap. It’s cool, man. Watch on YouTube for high definition. Great news. There’s a proper difference between the different grades in the new 2017 version. In terms of darkness and in terms of point retention. 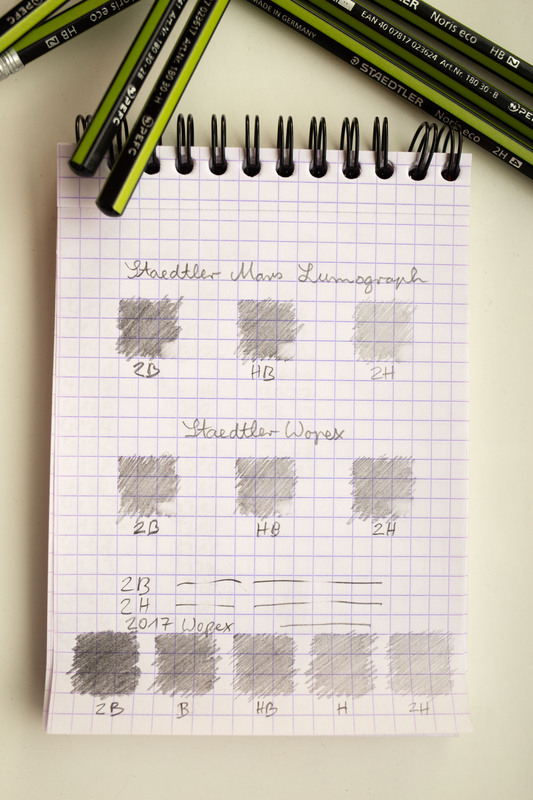 Compared to the Mars Lumograph in 2B, which is a very easy to erase pencil, the new Noris eco in 2B is more difficult to erase. If you see them in a shop I urge you to give them a try. The pellets before they’re extruded into a pencil. From the Wopex sharpener blog post. I think the Pen Addict never had a Wopex review. If he did please let me know. Some more post-2012 Wopex reviews can be found at Pencil Revolution, Comfortable Shoes Studio, The Weekly Pencil, The Finer Point, Pens Paper Pencils, Office Geek, Scribomechanica. At the top, you can see the alternative black and green Wopex pattern. A picture from the ‘epic fail’ blog post. I would like to thank Benedikt Schindler for his help in getting me the new 2017 Wopex. I still haven’t seen them on the high street in the UK. I guess I’m a glass half empty guy. One of my Wopex in 2H broke today. 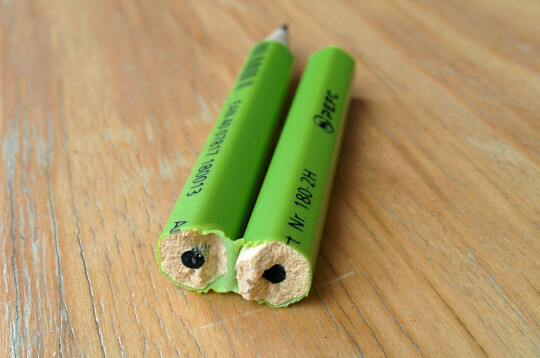 A glass half full guy would probably rejoice, now being in possession of two pencils instead of one. I used it to open one of the fire doors at work using the pencil. Something I am sure I did with other (wooden) pencils in the past. They survived, my Wopex didn’t. I guess the fact that it the Wopex is hard to sharpen made me subconsciously assume that it would have a high fracture strength.